Description: Evergreen shrub, about 1 m tall; leaves pinnately compound with 7-13 oval, leathery, satiny pubescent leaflets; flowers pea-like, purple (rarely white), about 25 mm long; pods 5-14 cm long, 10-14 mm wide, slightly constricted between the seeds; seeds quadrangular, reddish-brown, 7-10 mm long, 6-7 mm wide. Flowers from late March to late April. Similar Species: Dermatophyllum secundiflorum is a taller shrub with leaflets that are hairless on the under surface. Its pods are more cylindrical and deeply constricted between the seeds, and its seeds are rounded and bright reddish-orange. Habitat: Outcrops of pink, limy, fine-grained sandstone that is 1-2 percent gypsum (by analysis) in Chihuahuan desert scrub and juniper savanna; 1,720-2,180 m (5,260-6,650 ft). Remarks: Dermatophyllum guadalupense is disjunct, but differs only slightly from Dermatophyllum gypsophilum, which occurs in eastern Chihuahua. 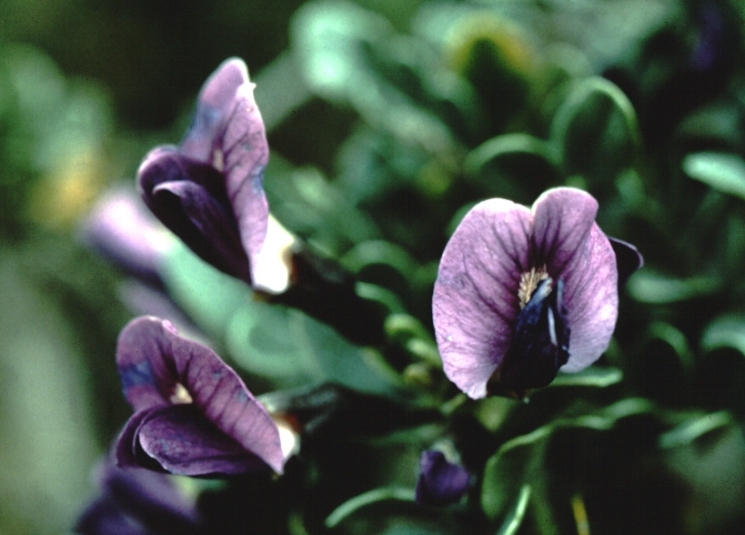 The Guadalupe Mountain plants have slightly larger seeds and hairier leaflets. The sandy, gypseous nature of this shrub's habitat is often masked by a surface pavement of limestone gravel and cobble. These gypseous soils are often indicated by the presence of Tiquilia hispidissima (an obligate gypsophile). Conservation Considerations: This is an attractive, unpalatable shrub. Its habitat is in a remote region and the current land uses do not represent any significant threats. Future oil or gas development in this area should attempt to avoid direct impacts on this very rare plant. Northington, D.K. 1976. Evidence bearing on the origin of infraspecific disjunction in Sophora gypsophila. Plant Systematics and Evolution 125:233-244. Sivinski, R.C. 1991. Status report on Sophora gypsophila var. guadalupensis. For U.S. Fish and Wildlife Service, New Mexico Ecological Services Field Office, Albuquerque. Turner, B.L. and A.M. Powell. 1972. A new gypsophilic Sophora from north-central Mexico and adjacent Texas. Phytologia 22:419-423. Turner, B.L. 2012. New names in Dermatophyllum. Phytoneuron 2012-3:1-4. Gandhi, K.N., M.A. Vincent and L.J. Reveal. 2011. Dermatophyllum, the correct name for Calia (Fabaceae). Phytoneuron 2011-57:1-4.